CW Leonis, a red giant star 500 times the size of the sun is located in the Leo constellation 300 light years away. This is an evolving star that is ejecting significant amounts of dust forming an enveloping cloud many times the size of our solar system. It has been the subject of hundreds of studies over the years, but only now has the existence of a smaller red dwarf star been found within the dust cloud. From 1994 to 2000, using a one meter telescope at the Observatory of Torino, Professor Richard Smart at the University of Hertfordshire observed a minute wobble in the motion of CW Leonis that defied explanation. This wobble was very small - equivalent to the side of a 10p coin on the Moon as seen from the Earth - but it was detectable. A recent study of the dust around CW Leonis revealed a swirl pattern that was hypothesised to be due to the presence of an unseen companion star. Introducing the companion resolved the 17-year-old mystery of the wobble. 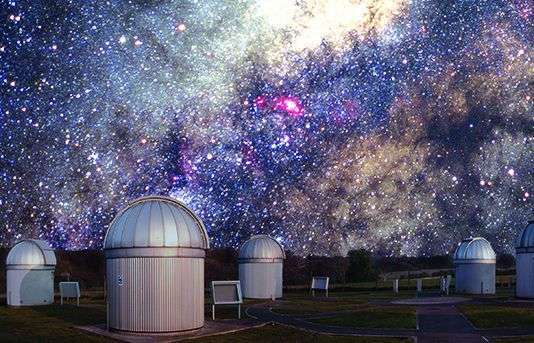 The research has been accepted for publication in Monthly Notices of the Royal Astronomical Society (MNRAS). Dr Alessandro Sozzetti, lead author from the Observatory of Torino, underlined: "The final result is that our analysis allows us to put new important constraints on the nature of CW Leonis' companion in terms of mass, separation, and orbital time. CW Leonis' companion is probably a massive star somewhat lighter than our Sun orbiting it with a period of just over 100 years." Professor Smart commented that that these observations were possible without the use of multi-million pound facilities. "This is a great achievement with a one-metre telescope from Earth, in the space missions and huge telescope era!" he said. "A better understanding of this object at this critical time in its evolution will aid our interpretation of similar objects that have evolved further into the beautiful, but complex, planetary nebulae."